Covering New South Wales, Northern Territory, Queensland, South Australia, Tasmania, Victoria, West Australia, Fiji, New Guinea and New Zealand, the Australian Handbook is a guide with all kinds of interesting unique information. Apart from a descriptive account and statistical information of each Australia colony, you will also find details on climate, education, religion, agriculture, population, societies and clubs, parliamentary and official departments, local self-government, telegraphic and postal details, police, banking, shipping, mining and land regulations, newspaper, manufacturers, emigration, as well as naval and military forces. You will also find details of the governors, consuls and ecclesiastical appointments of the time. The Importer's Directory, which takes up over 270 pages, is a comprehensive listing of all importers, manufacturers and shippers. For this importers you will find their name address and what they import (ie. machinery, groceries, hardware, musical instruments, or sewing machines etc.). Lists manufacturers and shippers from places throughout England, Scotland, Ireland, France, Germany, the United States, and importers throughout Australia, New Zealand and Fiji. "What can I find in this collection?" This handbook covers the whole Australian region. It is mainly concerned with giving an oversight of each Australian colony and is aimed more at the commercial sector. It has very useful potted histories and maps of each colony as seen in the perspective of 1900. This year contains 1012 pages packed with all kinds of useful and interesting information. 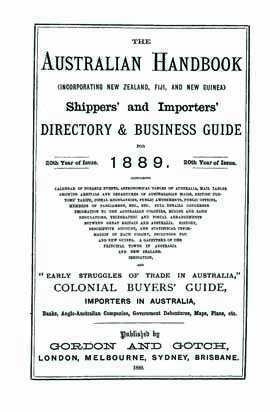 The outline on the title page gives some idea of its contents and scope: "Australian Handbook (incorporating New Zealand, Fiji, and New Guinea) - Shippers, importers and professional Directory & business guide for 1904, 35th year of issue - Containing Calendar of notable events, Mail tables showing arrivals and departures of Australasian mails, British customs' tariff, postal regulations, Public amusements, public offices, members of parliament, etc., etc. Details concerning emigration to Australasia, Mining and land regulations, Telegraphic and postal arrangements between Great Britain and Australia, History, descriptive account, and statistical information of each state, New Zealand, Fiji and New Guinea, A gazetteer of the principal towns in Australia and New Zealand, Irrigation Colonial buyers' guide, Importers in Australasia, Banks, Anglo Australian companies, government debentures, Maps, Plans, etc." The gazetteer alone is worth the purchase price. This covers well over 3000 towns and villages throughout Australia and New Zealand in nearly 300 pages. It gives "particulars as to situation, population, means of communication, hotels, churches, trade, manufactures, etc". This is a terrific genealogy resource for anyone exploring their family history or building their family tree.